Karen Radner, Janoscha Kreppner & Andrea Squitieri (eds. 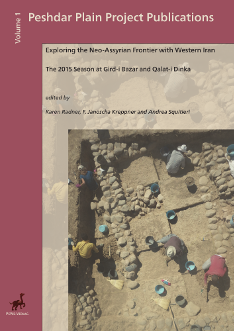 ), Exploring the Neo-Assyrian Frontier with Western Iran: The 2015 Season at Gird-i Bazar and Qalat-i Dinka. Peshdar Plain Project Publications 1. Gladbeck: PeWe-Verlag, 2016. ISBN 978-3-935012-20-1. Print edition: 29,80€; 30 x 21 cm; hardcover. Karen Radner, Janoscha Kreppner & Andrea Squitieri (eds. 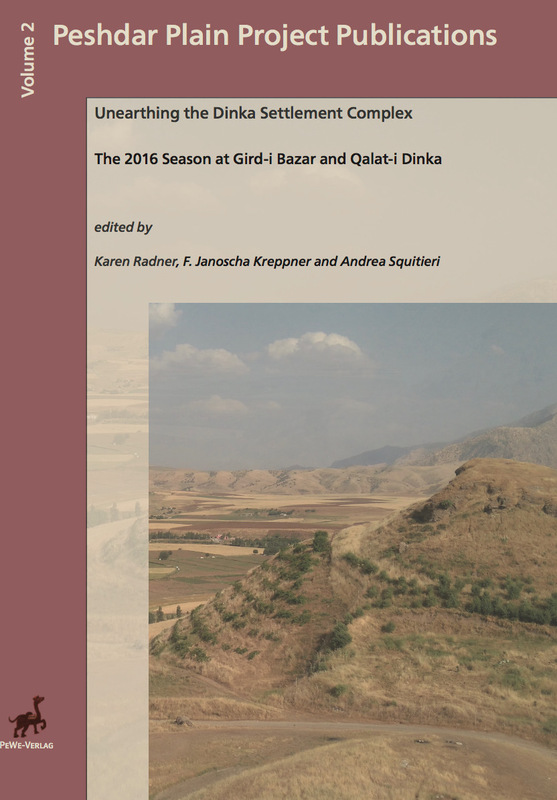 ), Unearthing the Dinka Settlement Complex: The 2016 Season at Gird-i Bazar and Qalat-i Dinka. Peshdar Plain Project Publications 2. Gladbeck: PeWe-Verlag, 2017. ISBN 978-3-935012-28-7. Print edition: 33,80€; 30 x 21 cm; hardcover. Karen Radner, Janoscha Kreppner & Andrea Squitieri (eds. 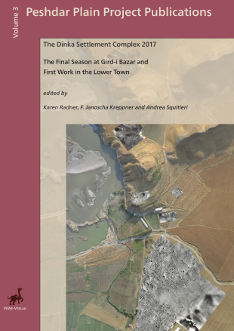 ), The Dinka Settlement Complex 2017: The Final Season at Gird-i Bazar and First Work in the Lower Town. Peshdar Plain Project Publications 3. Gladbeck: PeWe-Verlag, 2018. ISBN 978-3-935012-32-4. Print edition: 34,80€; 30 x 21 cm; hardcover. 1. Panoramic view of the Peshdar Plain in the Kurdish Autonomous Region of Iraq. Set in the extraordinary mountainscape of Iraqi-Kurdistan (fig. 1), the Peshdar Plain is situated in the province of Sulaymaniyah, district of Qaladze, in the Kurdish Autonomous Region of Iraq, directly at the border with Iran on the upper reaches of the Lower Zab. The regional centre is the town of Qaladze (Qalat Dizeh), in the northwest of the plain, whose impressive settlement mound (36° 11’ 7” N, 45° 6’ 53” E) demonstrates that the site has held this position since antiquity. Our research throws light on a hitherto little known frontier region of the Assyrian Empire (c. 900-600 BC), specifically the Border March of the Place Herald at the border to the kingdom of Mannea. 2. The extent of the Assyrian empire in the late 8th century BC and the location of the Peshdar Plain with Gird-i Bazar and Qalat-i Dinka and some key reference sites. The Peshdar Plain Project was inaugurated in 2015 and aims to uncover the ancient history of this understudied area with a focus on the 9th-7th centuries BC when the Neo-Assyrian Empire controlled the region (fig. 2). 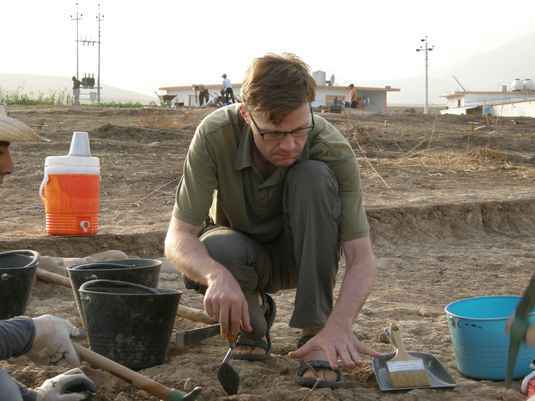 To this end, it brings together a wide range of international experts in history, archaeology, archaeobotany, archaeozoology, geoarchaeology, archaeometry, geophysics, photogrammetry & 3D modelling, microfossil analysis, GIS and cuneiform studies. The Peshdar Plain Project focuses on two sites: tiny Gird-i Bazar (36° 8’ 18” N, 45° 8’ 28” E), a shallow mound (altitude: 539 m) of only 1.5 ha situated in the plain, and the more impressive Qalat-i Dinka (36° 8’ 12” N, 45° 7’ 57” E; altitude: 579 m), looming high over the Lower Zab on the imposing terminal outcrop of a crescent-shaped mountain range along the northern river bank (fig. 3). This is a salvage project as the plain is undergoing rapid economic development in the agricultural sector, with the accompanying damages endangering to its archaeological heritage. 3. 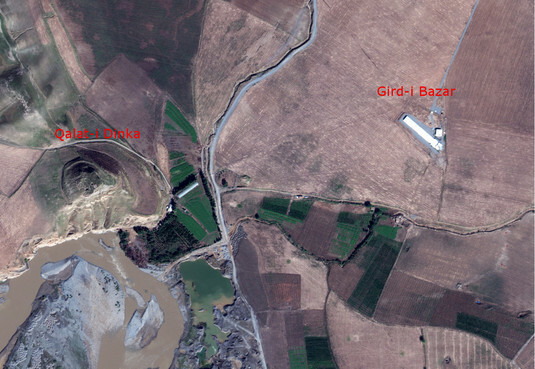 Bird's eye's view of Qalat-i Dinka and Gird-i Bazar. 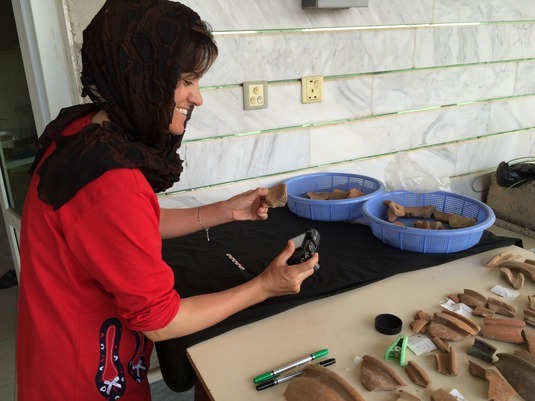 During a visit to the Raniyah Plain on 16 February 2015, Barzan Baiz Ismail of the Sulaymaniyah Directorate of Antiquities and Heritage showed Karen Radner a fragmentary cuneiform tablet that had been found during agricultural work at Qalat-i Dinka in 2013. The autopsy of the secondarily fired tablet showed it to be a Neo-Assyrian legal document from the year 725 BC with an intriguing mention of a servant of the Palace Herald. A subsequent visit to Qalat-i Dinka and also nearby Gird-i Bazar, following the suggestion of Jessica Giraud, director of the Sulaymaniyah Governorate Archaeological Survey (MAFGS) who surveyed the region in 2013, revealed that the latter site had been substantially damaged a few months earlier by the construction of an industrialised chicken farm. 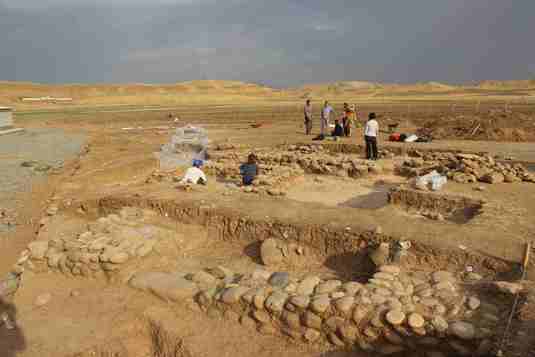 It was quickly decided that salvage excavations at the imperilled mound should take place in conjunction with a wider investigation of the Peshdar Plain, including excavations at Qalat-i Dinka which is threatened by agriculture. The Sulaymaniyah Directorate of Antiquities and Heritage, headed by Kamal Rasheed Zewe, offered immediate administrative support and subsequently supplied invaluable personnel and logistic assistance to all aspects of the project. 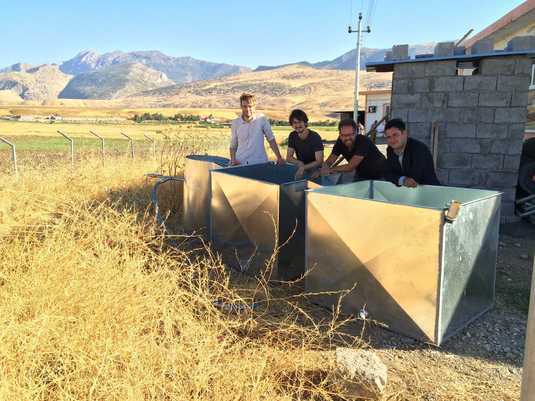 Funding for a first fieldwork season was readily available, as Radner had just been awarded the International Award for Research in Germany (Alexander von Humboldt Professorship), and Janoscha Kreppner quickly agreed to direct the fieldwork. 4. After the successful assembly of the flotation machine. From left: Peter Bartl, Jean-Jacques Herr, Christoph Forster and Barzan Baiz Ismail. In the first field season in August and September 2015 (figs. 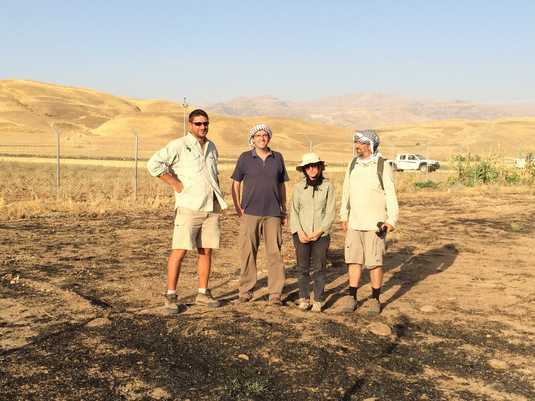 4-7), a geophysical survey was conducted at both sites and salvage excavations began at Gird-i Bazar, the first Neo-Assyrian site to be excavated in the region (figs. 8-9). 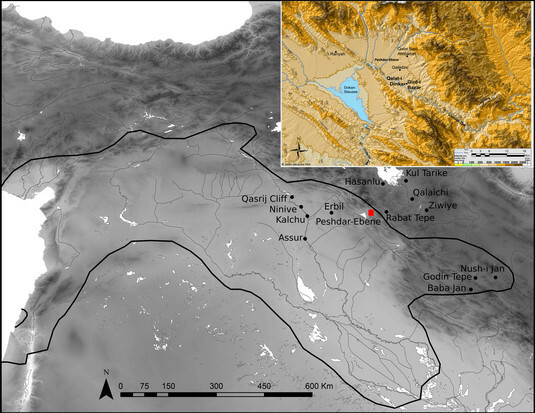 The settlement beginning to be uncovered here provides not only the rare opportunity to explore a non-elite production complex of the Neo-Assyrian period at the empire’s frontier but also the crucial chance to synchronize the Western Iranian pottery cultures with the Assyrian material of the 8th and 7th century BC. 5. Left: Hero Salih Ahmed processing pottery. 6. Right: The final days of the 2015 excavation at Gird-i Bazar: Alice Hunt, Tina Greenfield, Hero Salih Ahmed and Adam Stone and Andrea Squitieri in the background. 7. Peter Bartl in action in the western trench. 8. 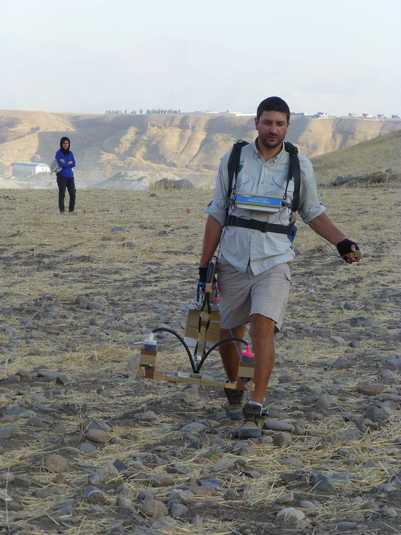 Left: Andrei Asandulesei hard at work during the geophysical prospection fo Qalat-i Dinka. 9. Right: The geophysical team at Gird-i Bazar. From left: Andrei Asandulesei, Janoscha Kreppner, Hero Salih Ahmed and Jörg Faßbinder. We are very much obliged to Kamal Rasheed Zewe and especially Saber Ahmed Saber of the Sulaymaniyah Directorate of Antiquities for their invaluable assistance in matters great and small in Sulaymaniyah and Qaladze and to our project partner Jessica Giraud (IFAO Erbil) for her engaged support in research and logistics. Thanks also to Adelheid Otto and Simone Mühl (both LMU Munich) for generously letting us benefit from their equipment and of course the Humboldt Foundation.